Rosen's Northern California ranch in San Gregorio, near the town of Half Moon Bay, has more animal than human neighbors, although musician Neil Young's place is down the road. It's a far cry from her hyper-urban New York roots, where she was once referred to as "the mayor of SoHo." 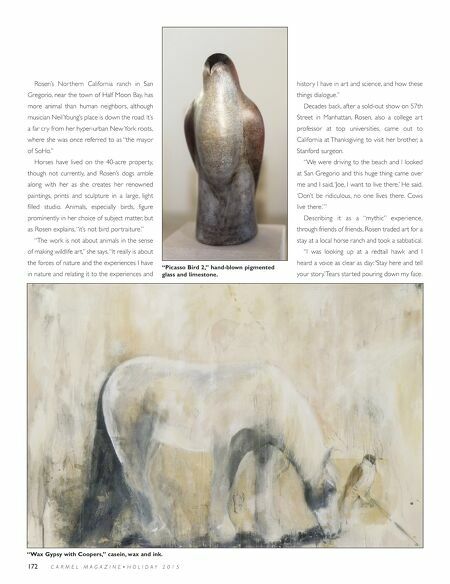 Horses have lived on the 40-acre property, though not currently, and Rosen's dogs amble along with her as she creates her renowned paintings, prints and sculpture in a large, light filled studio. Animals, especially birds, figure prominently in her choice of subject matter, but as Rosen explains, "it's not bird portraiture." 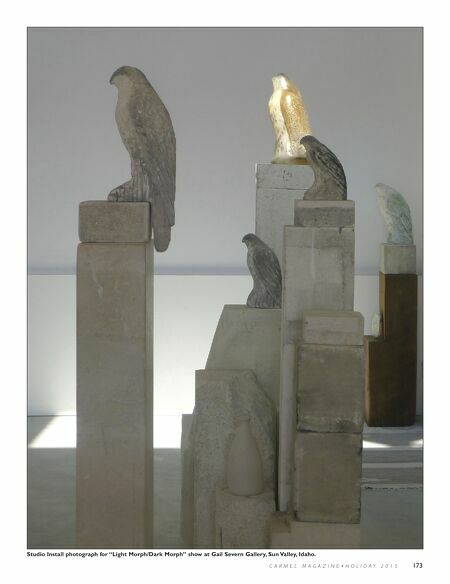 "The work is not about animals in the sense of making wildlife art," she says. "It really is about the forces of nature and the experiences I have in nature and relating it to the experiences and history I have in art and science, and how these things dialogue." Decades back, after a sold-out show on 57th Street in Manhattan, Rosen, also a college art professor at top universities, came out to California at Thanksgiving to visit her brother, a Stanford surgeon. "We were driving to the beach and I looked at San Gregorio and this huge thing came over me and I said, 'Joe, I want to live there.' He said, 'Don't be ridiculous, no one lives there. Cows live there.'" Describing it as a "mythic" experience, through friends of friends, Rosen traded art for a stay at a local horse ranch and took a sabbatical. "I was looking up at a redtail hawk and I heard a voice as clear as day: 'Stay here and tell your story.' Tears started pouring down my face. "Wax Gypsy with Coopers," casein, wax and ink. 172 C A R M E L M A G A Z I N E • H O L I D A Y 2 0 1 5 "Picasso Bird 2," hand-blown pigmented glass and limestone.